One of my earliest Sunday school memories is singing the song about the wise man who built his house upon the rock, and the foolish man who built his on the sand. We sang loudly and acted out the falling house with great enthusiasm. I determined that I didn’t want my house to fall, so I was going to listen to Jesus’ words and do what he said. I was recently challenged when I read that story from the end of Luke 6 in the context of the whole chapter. What are these words that I need to put into practice? Feeling decidedly uncomfortable, I read on: “Give to everyone who asks you, and if anyone takes what belongs to you, do not demand it back” (v30). “But love your enemies, do good to them, and lend to them without expecting to get anything back” (v35). Then Jesus introduces the story of the two builders with a question: “Why do you call me, ‘Lord, Lord,’ and do not do what I say?” (v46). 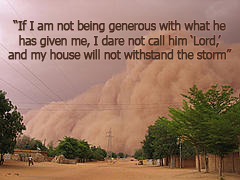 If I am not being generous with what he has given me, I dare not call him “Lord,” and my house will not withstand the storm. 1. After reading Luke 6, are there changes you need to make in order to be like the wise builder? 2. Why is generosity so closely related to calling Jesus “Lord”?